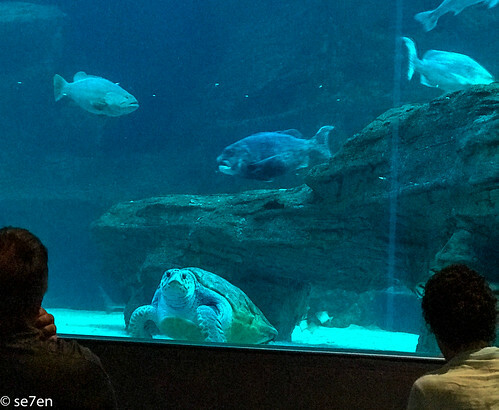 Another week and another visit to the Two Oceans Aquarium. 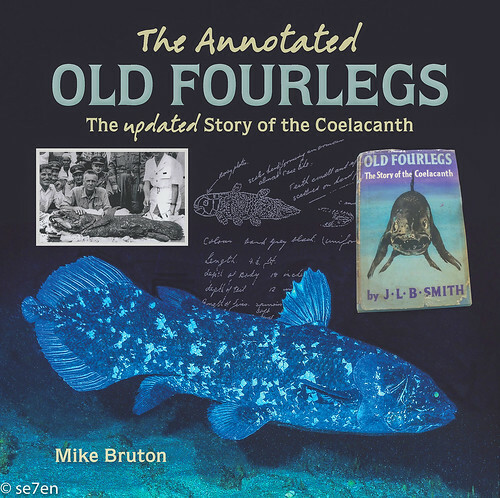 We recently attended the book launch of Struik Nature’s The Annotated Old Fourlegs by Mike Bruton, at the aquarium. 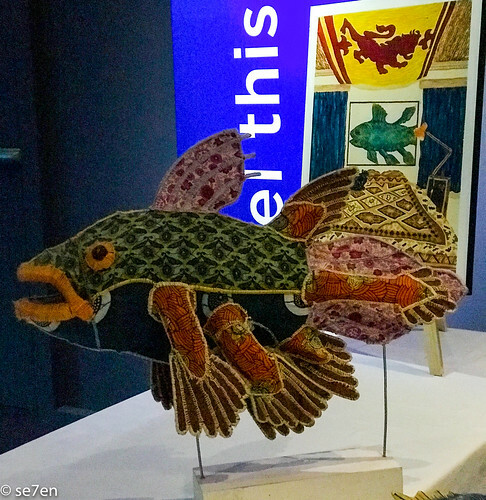 This is the story of the mysterious Coelacanth, a fish that appears to have four limbs from the fossil records, but these are fins that provide exquisite balance so that they never actually touch the ground. 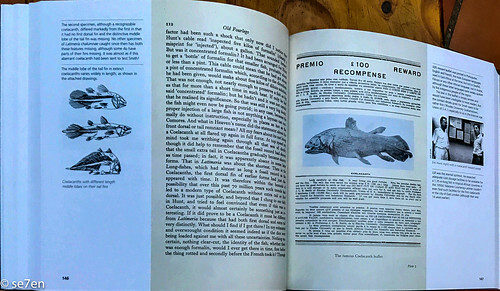 The book provides a historical account of the fascinating discovery of the coelacanth, after it had been thought to be extinct. It makes for quite a gripping read, not to mention all the players involved were very interesting characters… and certainly provide bookworthy reading throughout. If you are looking for a good read for a nature loving, historian then you have just found it. 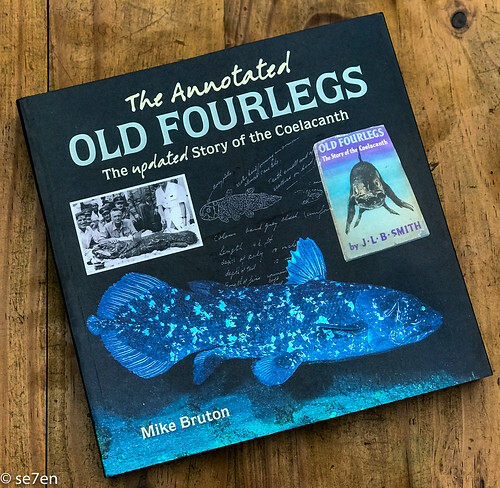 Old Forelegs, the story of the Coelacanth by J.L.B.Smith, was first published in 1956 and was the book about the discovery of the once thought to be extinct Coelacanth. With the story unraveling throughout the book, you don’t miss a thing, it has been cleverly designed so that you can read the original book and learn about the unfolding drama, but so much more… because as you read the original story they have created margins for a commentary and tons of new photographs and anecdotes. 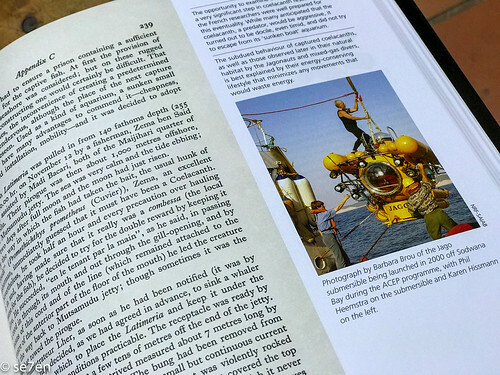 The original book reads like a saga… bringing the adventurous life of a scientist straight onto the reading pile of folk all over the world. This book really did hale the popularisation of science for everyday people, with six later English editions and it has been published in several other languages as well. This new and annotated book, is indeed an updated story of the original book and is literally a book within a book. I love it, you can still read the original version, with all the peculiarities of life in South Africa in the ’50’s and alongside all the new discoveries and essential comments to bring the reader up to date. His purpose was to not just keep the story alive, but to bring it up to date. The author, Mike Bruton, was inspired by Martin Gardner’s Annotated Alice, and spent a year gathering data and doing new research for it. 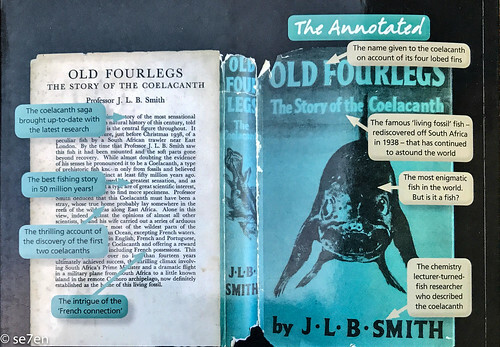 Around the 1956 edition of the book, new commentary and new insights have been added into the book, and hence the feel of a book within a book. 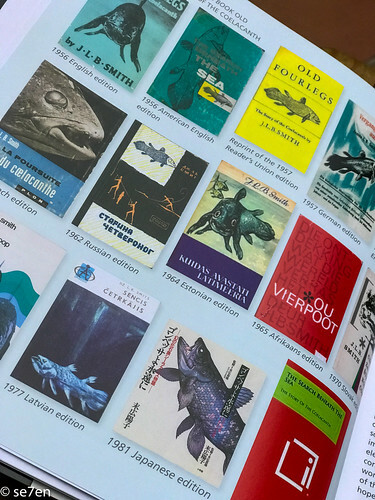 Naturally the coelacanth story, is one that has captured the heart and imagination of folk all over the world and so the story didn’t just end on publication in 1956, but the story goes on. 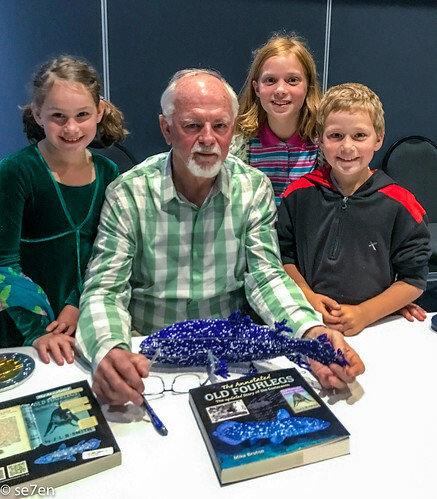 My guys were excited to meet the author, it is not often that you meet someone who knows all about these interesting fish. 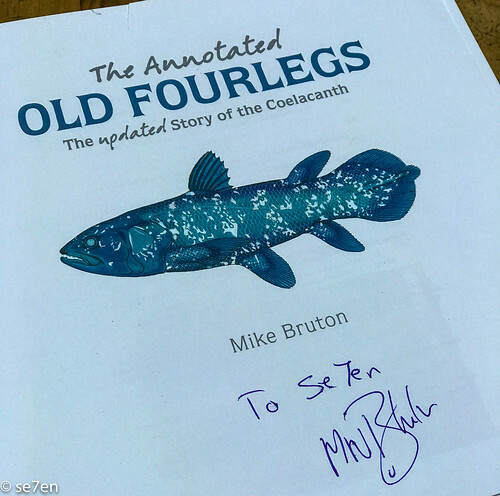 The author grew up in East London, and as a keen fisherman was destined to come across the Coelacanth. If not in the sea then at the East London Museum. The nature of this book, is that it is a book within a book and hence there are essentially two authors. The original author, J.L.B.Smith, grew up in Graaff Reinit, and while he was at school started a school museum. After achieving the highest marks in the country for chemistry, he went on to study at Oxford. He returned as a lecturer to Stellenbosch university. He loved fishing and would cycle down to Cape Point to go fishing!!! After Stellenbosch he went on to Rhodes University and that is where his passion for fish came to the fore, and he started the Department of Ichthyology. Coelacanth fossils have been found all over the world, and are well known in the fossil record. They were contemporaries with well known dinosaurs and in fact one of them was found inside the remains of a spinosaurus. The significance of rediscovering these living fossils is that they give a vision into ancient life. Fossils have been found in estuaries and fresh water, but there is no fossil record for deep waters. In fact they live at about 800m depth and they are not considered deep water fish. 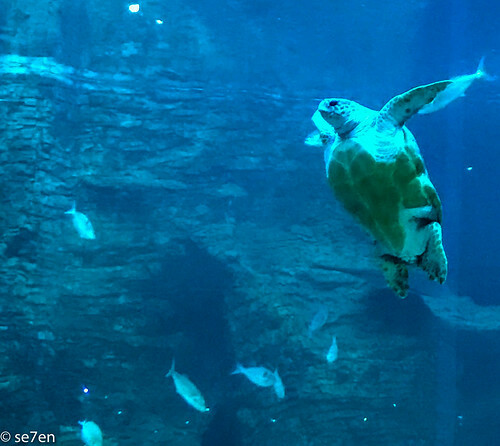 The Coelacanth is known as the Panda of the seas, a symbol of conservation. Their images have been posted on stamps and money, postcards and the list goes on. You may have even spotted Japanese Fish Print of one of them. They can be found in canyons north of Madagascar, and in Indonesia, both sides of the Indian Ocean. Also around the Pacific rim of fire. In fact you can apparently go diving off Gondwana at the Triton dive lodge, and see them. Live catches off Sondwanaland, have revealed that they have unique patterns and they could create an inventory of unique identikits of every living Coelacanth. Fishermen catch the fish, which are comfortable at a depth of 800m, with their 1.5km coconut fiber lines. Nets don’t work there, they have to use long lines. Also, modern gill nets set for sharks of Tanzania catch them. There is in fact a coelacanth resuscitation unit Dar es Salam, because the fish can survive 36 hours after capture, if returned to water. They used a Jago to Study the live animals. They discovered that they are social animals that gather in caves and hunt at night. They have an extremely long gestation, 36 months. This low production rate does mean that there always is that extinction risk. This species has survived lots of ice ages, mass extinctions and will most likely survive global climate change. We are the endangered species here and the coelacanth may out live us. The effects of choral bleaching and plastic waste still has to be determined. But the ocean off Tanzania is particularly clogged with plastic. They are very susceptible to dtt poisoning because they are high up the food chain. 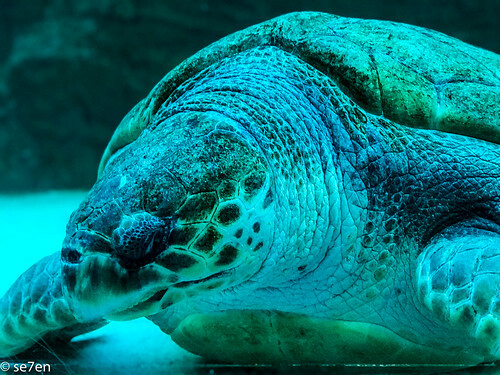 While they were initially against keeping them in captivity to observe, because if one is in captivity then everyone will want one. 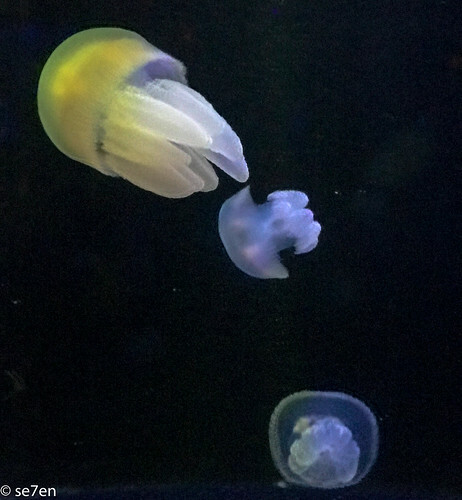 However scientists realise that there is a lot to learn about them and they are relatively easy animals to care for… they are very slow moving, they eat from your hand, they like cold oxygenated water and are very sensitive to light. Huge thank you to Struik Nature and Penguin Random House South Africa for inviting us to their event, we did receive a copy of the book for review purposes. This post is not a sponsored post and opinions expressed are entirely our own. 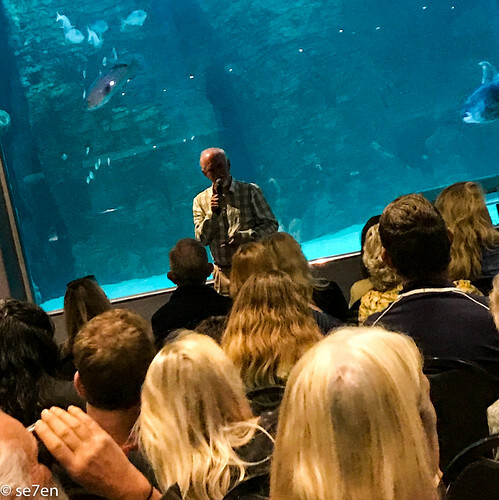 Thank you also to the Two Oceans Aquarium, always a great location for an event… fabulous catering, fabulous venue… perfect evening.